You’ve heard it said, “Everyone’s Irish on St. Patrick’s Day.” Well, I’m either one quarter or one eighth Irish, depending on which relative I consult, and I can tell you that, sadly, I don’t qualify as truly Irish on St. Patrick’s or any other day of the year. I’m not proud to say so, but it’s true. It’s not for lack of trying. I went to an Irish Catholic school where several of the nuns were direct from Ireland, replete with charming accents– though the nuns themselves were rather sour. One of the nuns walked into my third grade classroom, declared that it was filthy, gave two boys a toothbrush, spat on the floor, and told the boys to start scrubbing. I sometimes think I might have known more Irish nuns than Irish families. The Irish families I did know lived in houses filled with crucifixes. I’m sure they must have had other decorative knick-knacks, but I only remember crucifixes. For me, everything Irish was a bit severe and austere– from the dour nuns to the simple cabbage and beef we ate on St. Patrick’s Day. Then one Halloween, the Irish Catholic school burned down under suspicious circumstances, and I was relocated to the Italian Catholic school. The Italian school was completely different. Holidays were more cheerful. The clergy enjoyed themselves (and their wine) a good deal more than the nuns ever had. The food at church events tasted better. Cannoli, ravioli, stromboli. And suddenly, St. Patrick was eclipsed by St. Joseph. St. Joseph’s Day is two days after St. Patrick’s Day, and the Italians loved it. Everyone ate zeppole (a little like cannoli, but better, so, so good), and wore red and white, and went to the Knights of Columbus parade. There were flowers and candles, an explosion of color. Mind you, I’m not trying to pick favorites. I’m just telling you what I experienced. For this St. Patrick’s Day, I plan to forgo the green beer– in fact, I’ll probably pass up the beer altogether. 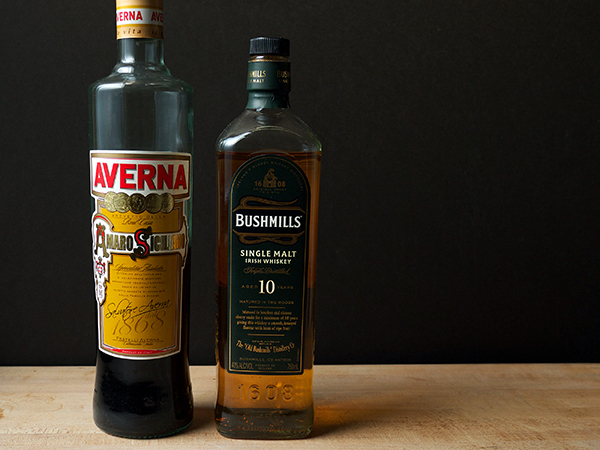 Instead, I’m mixing up a cocktail with a bit of a mixed heritage: half Irish whiskey, and half Italian amaro. 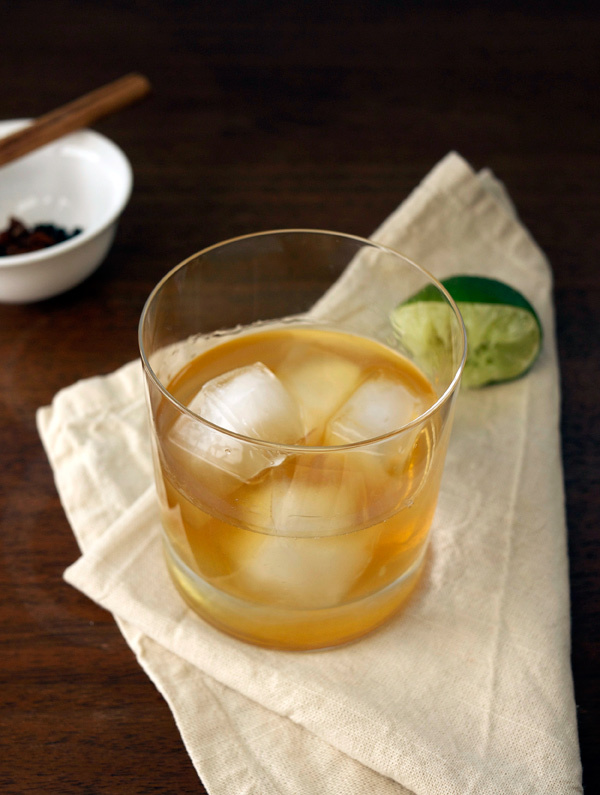 Combine whiskey, amaro, lemon juice and syrup together in a shaker filled 2/3 with ice. Shake and strain into a chilled cocktail glass. 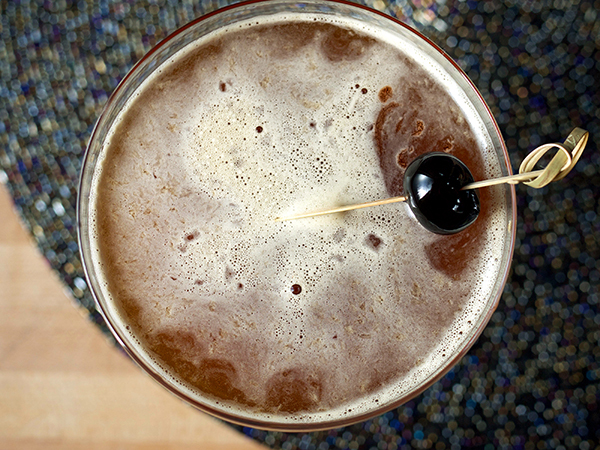 Garnish with the cherry. 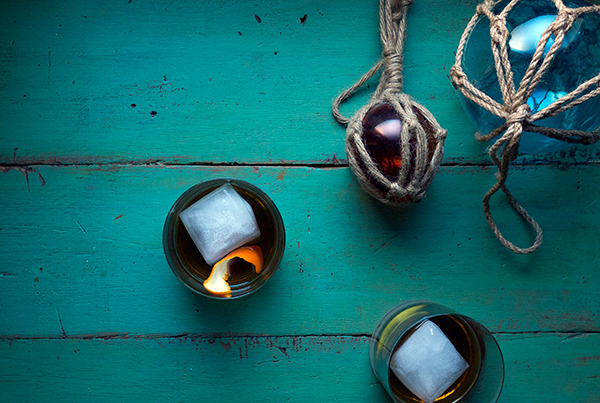 There’s a nice contrast between the light, floral whiskey and the spicy, rich amaro. 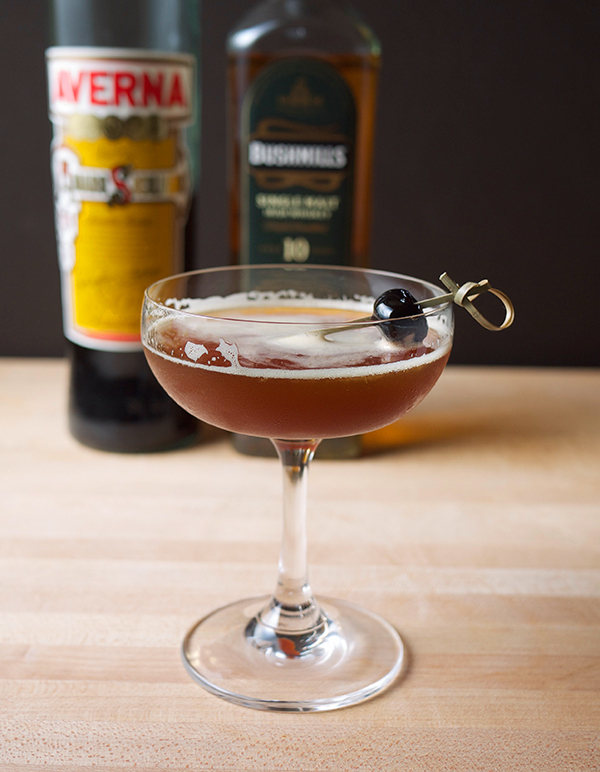 It starts with a punch of sour flavor that immediately moves into sweetness, and the bite of the whiskey and the lasting bitterness of the amaro stay with you until the next sip. It’s a cocktail with a lot of character. Like those Irish nuns. And those Italian priests. ***This recipe was originally created for Serious Eats and appeared on the site this past week. I know. That’s a mouthful of a title. But in actuality it’s an incredibly easy drink to make so don’t go running off just yet. Right now I’m on a kick of making life EASIER for myself. I’m hustling in other areas so that means the drinks need to get whipped up with ease. Are you hustling in life? This one’s for you then. I’ve come into possession of a number of rums as of late. In part, I’m tasting them for potential candidates to star in The Coconut Club drinks. Not all our drinks are rums, but we ARE a Tiki supper club, so we NEED some rums. And the other reason is that, after many years, I’ve come to like and appreciate rums. If you’ve been a long time reader on here, you may remember in the early years of this site that I was frequently confused by rum. I blame my mother’s rum and cokes that I would sneak sips of during bedtime story readings, and would cringe with disgust (I still don’t like them), as to why I had such distaste for the liquor. It turns out I was just drinking the wrong kind of rum. So fast forward to now. As I said, I’ve been filling my days with a lot of other work that sometimes makes tinkering all day with drinks hard, if not impossible. When that happens there will suddenly be a lot of Manhattans or Negroni cocktails around the house. In doing so I finished all the Campari. And then I was out of rye. And then I decided what the hell am I doing?! Make something just a tad more creative lady!! In stepped a bottle of rum and my copy of The Bar Book . Still looking for a straightforward cocktail I looked to Morgenthaler’s Rum Old Fashioned. If the rum is good, like the bottle I had on hand, then you just want a few elements to highlight that rum; an Old Fashioned is perfect for that. I made the first round exactly as it was laid out in the book: the result was good but then my eye drifted over to the (vast) array of bitters taking up more space every day on the bar shelf. Smoked orange bitters! Yes! The next round I changed it up, taking the lime peel out, adding in some smoked orange bitters, a spritz of orange oil; it changed the whole drink. Just as tasty as the first, but all new flavors that still highlighted the base rum, just in different ways. The recipe below is for the latter (go buy the book for his recipe and learn some more drinks!). 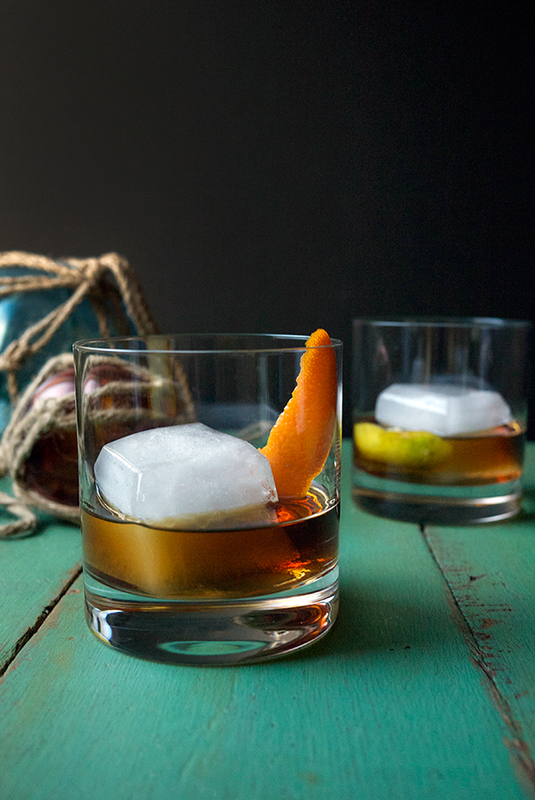 In a double old fashioned glass, add a large cube of ice. Build the drink by pouring in rum, syrup and the bitters. Gently stir 15 seconds. 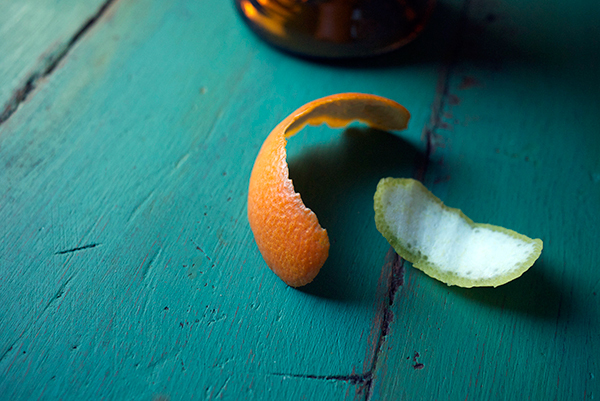 Squeeze the orange peel over the drink to release the oil and add the peel to the drink. *This bottle was generously given gratis and appears here because I like drinking it. For more info on sponsored products, affiliate links, and gifted booze, please visit the About page. Apologies for the hasty nature of this post. I’m heading out the door on my way to Palm Springs Modernism Week to bask in even hotter temps than Los Angeles and to have my eyes filled to the brim with mid-century architecture. I almost didn’t make this month’s Mixology Monday, “Sours” hosted by the Ginhound blog, but remembered that I have a cocktail for a supperclub dinner coming up next week that would fit the bill. Ti’ Punch is in that sour category alongside daiquiris, margaritas, etc… A liquor at the base with a sour component and a sweet. To fit the theme of the dinner, I created a 5 Spice Ti’ Punch, infusing the whole spices usually found in that blend into a demerara syrup. The result was a honey rich syrup that almost had a “chai” like aroma to it. Not too overbearing on the palate but enough of a kick to give the drink an unexpected new flavor profile. In keeping with tradition of the Ti’ Punch being an aperitif (served before a meal), this strong tipple will be served to guests arriving. Hopefully it will loosen the tongue just enough to make this a lively dinner. This will be served punch style, however for this recipe, I’ve scaled it down to a punch for one. First, let’s make the syrup! Combine sugar and water over medium high heat in a small sauce pan. Stir to dissolve the sugar and then add spices to the pan. Bring to just a boil and then remove from heat. Cover and let sit for 30 minutes. Uncover and let come to room temperature. Strain into an airtight container. In a mixing glass 2/3 filled with ice, add rhum, lime juice and syrup. Stir 30 seconds to chill and then strain into an iced filled rocks glass. This is one boozy sour. That grassy cinnamon agricole rhum comes in at 100 proof, so you’ll probably only need just the one punch. But by all means have two if you want. 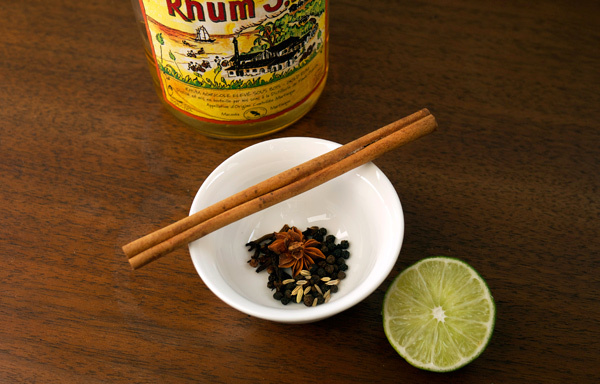 The 5 spice compliments the rhum more than overpowers it in that hey-look-at-me way that 5 spice sometimes can. Infusing the spices in a demerara sugar created a viscous, honey like syrup that had a deeper color and flavor than regular cane syrup. Also, I thought it would have a better mouthfeel in a drink served over ice. The syrup really does taste more like a chai than what I associate with this Chinese spice blend too. Overall a satisfying cocktail with some bite. Note, I did use black peppercorns rather than Sichuan ones, but only because the black were readily available and I was short on time. Had I been able to use the Sichuan, the flavor profile could have turned out a different way. If you get your hands on some and make this, I’d love to hear about how yours turned out. Thanks to Andrea for hosting this month’s Mixology Monday! Please visit her site and check out everyone’s entries.